Peach State Roofing Inc. is a member of Johns Manville’s 2018 Pinnacle Council. 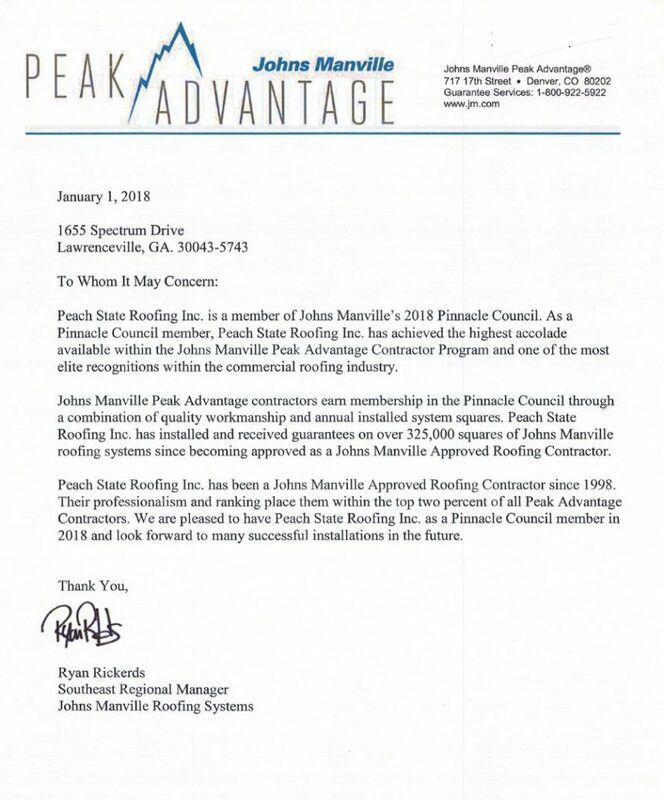 As a Pinnacle Council member, Peach State Roofing Inc. has achieved the highest accolade available within the Johns Manville Peak Advantage Contractor Program and one of the most elite recognitions within the commercial roofing industry. Johns Manville Peak Advantage contractors earn membership in the Pinnacle Council through a combination of quality workmanship and annual installed system squares. Peach State Roofing Inc. has installed and received guarantees on over 325,000 squares of Johns Manville roofing systems since becoming approved as a Johns Manville Approved Roofing Contractor. Peach State Roofing Inc. has been a Johns Manville Approved Roofing Contractor since 1998. Their professionalism and ranking place them within the top two percent of all Peak Advantage Contractors. We are pleased to have Peach State roofing Inc. as a Pinnacle Council Member in 2018 and look forward to many successful installations in the future.